This level has medium difficulty. For this level try to play from top part of the board where more candies available to play and make special candy. 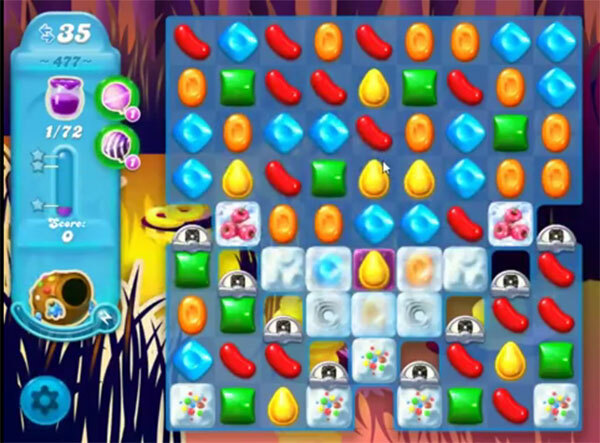 Combine special candies with each other to spread the Jam within less moves. Or play near to Jam candy to spread it to near candy to spread Jam to all over the board within 35 moves. IMPOSSIBLE, I’M ABOUT TO GIVE UP AND GET A LIFE !!!!! I’ve been on this level for months, I’m ready to to stop playing. I’ve also been faithful to get my game pieces for 107 days, I’m to the point I’ll give them up also. One thing that aggravates me to no end is I use the fish in my awards but the game will hardly give me moves to use them so they are wasted . Ready to give up also .